Recently, having long been aware of these ‘practical drawbacks’ I tried again to investigate possible alternatives. I remembered that I’d been able to peel the paper off certain kinds of black foamboard in the past but had never tried to create surfaces with them. I spent a morning and came up with some quite positive results! I had a number of old scraps of 5mm black foamboard, some noticeably different from others. The paper covering could be peeled from some, but not all .. I’ll come back to that later! 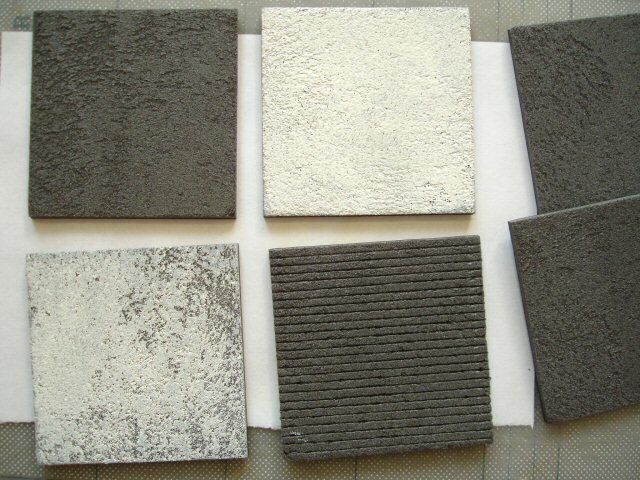 Above are some tests being made on small samples of foamboard with the paper peeled off. Sometimes the paper comes off quite easily and the foam surface remains fairly smooth and unmarked. Sometimes removing the paper rips up the foam slightly but this can also create an interesting surface. Acrylic gesso binds well with the foam surface as do all the acrylics I’ve tried (the bottom sample is a very light coat, while the top shows a heavier one). Also at the bottom is a brickwork pattern just started, beginning with the horizontal lines (just inscribed with a mechanical ‘push-lead’ pencil). One thing I’ve found is that the bottle acrylics (such as DecoArt, Inscribe etc.) tend to be more opaque than regular tube acrylics (such as System3). This makes them better suited for these heavier dry-brushing effects, unless you want the black to keep showing through. Above, I’ve broken up the brickwork pattern by scraping with the tip of a scalpel and pressing the foam in places. I haven’t even bothered to painstakingly include the vertical brick divisions. I depends what level of realism you want, but I don’t think it’s always necessary. Below is an additional sample in which I’ve just patterned portions of the foam surface as brick and left others flat which are then gesso’d. Another recent discovery I made when experimenting with the denser Kapa-line foam was the heavy woody effect which can be made by firmly dragging a wire brush along it a few times. As you can see below this works perhaps even better with the cheaper black foamboard. I wouldn’t recommend this if you were trying to model fine interior floorboards but it’s exactly right for rough, worn or weathered timber. 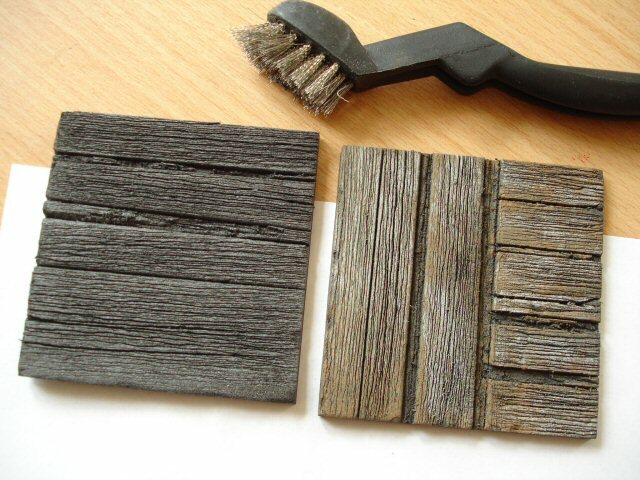 The sample on the right has been skimmed over with raw umber and light grey acrylic. Now to the slight problem! I mentioned that the paper can be peeled from some types of black foamboard but not all. I can’t tell you which will work simply by brand name because most often what you find is ‘unbranded’ in that, as far as the shop is concerned, ‘black foamboard’ is enough of a name and they don’t know or particularly care about where it comes from. All I can say for the moment is that if the 5mm foamboard you find is a tiny bit less than 5mm thick and the foam edge is slightly greyish then it’s likely to work. On the other hand there’s a type that is very slightly more than 5mm thick with a darker, less dense, more ‘glistening’ foam edge and this is not likely to work. If I find out more I’ll post it here! Here there isn’t much need for a list of suppliers because it’s likely to be stocked in almost all art/craft or graphics shops. In London I usually get mine, a little discounted, from University of the Arts (UAL) college shops, currently £6.55 for an A1 sheet (November 2014). These shops aren’t open to the public anymore, but the 4D modelshop or the Paperchase ‘flagship’ in Tottenham Court Rd sell it at fairly standard prices .. around £6-7. As I’ve said, these are likely to be different brands and there will never be any guarantee that one will behave exactly as another. The only ‘branded’ black foamboard I’ve come across has been either Westfoam (4D modelshop and online) or Frisk Biodegradable Foam Board (online). The Frisk type has worked very well when I’ve tried it in the past but it’s more expensive than Kapa even .. currently on amazon.co.uk costing £12 for a pack of just two A2 sheets! 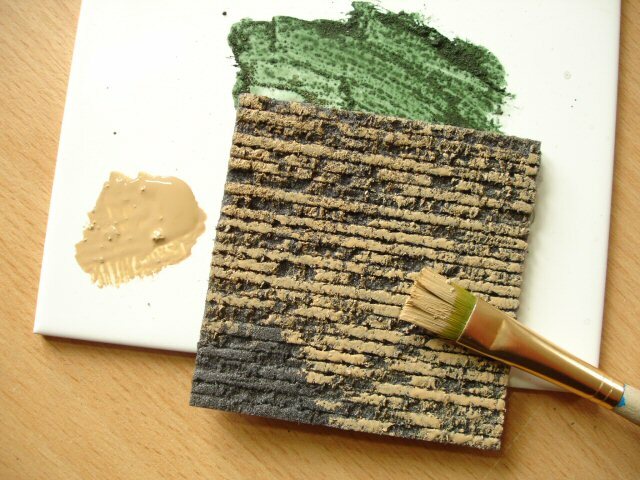 Using heat gun or hair-drier on foamboard to assist removal of the paper does work! Finally I’ve had a chance to test the advice that ‘davie’ posted here earlier in the year using a small heat gun and it worked remarkably well as soon as I’d got the knack of ‘heat ‘n’ pull’ in stages! 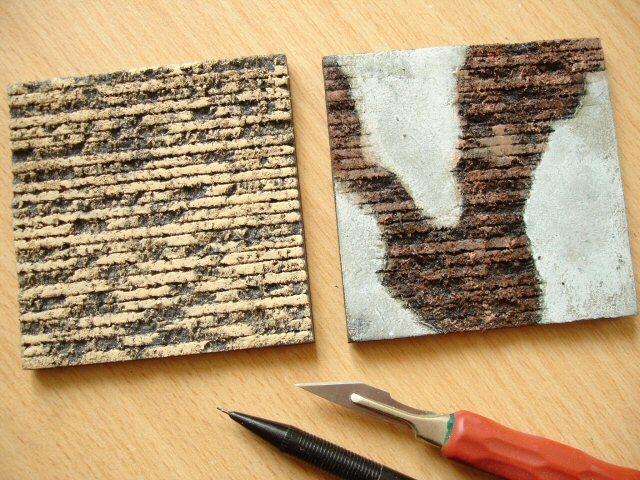 The heat melts the bond between the foam and the paper but these very quickly re-bond on cooling so the best way is to start by loosening just a corner, peeling up, and then progressing in diagonal strips until reaching the opposite corner. Keep the hot air away from the exposed foam if using a heat gun because although polystyrene will withstand the heat of hot coffee it will shrivel under a heat gun, though hopefully not under a hair-drier! I tested this during a recent model-making course, so the students had an opportunity to try and they managed it fairly well. Although I didn’t see this, one of them told me that she’d peeled a small piece just by breathing on it in stages! .. I believe her, but I really have to try this for myself. For this course we were using black foamboard bought at the Central Saint Martins (UAL) college shop. Although this is ‘unbranded’ I’m pretty sure that this is supplied by the wholesale supplier Seawhite of Brighton, but where they get it from I don’t know. I noticed for the first time with this foamboard that the two paper covering layers have slightly different thicknesses and that the thicker side was easier to remove, even carefully by hand without the assistance of heat. There is quite a lot on web forums dealing with different ways of removing paper from polystyrene-core foamboard .. including soaking in hot water, even using other solvents .. which one can find using a search terms ‘peeling’ or ‘removing paper from foam board’ for example. Most of this info comes from the flown model aircraft ‘community’. What I meant was .. it’s easy to get the wrong thing unless you know what it’s proper name is, especially on ebay or Amazon. ‘Foamed PVC’ can be found there yes, but not cheap! Cheryl, I would be careful re scale at 1:48 .. it works better for bigger scales. Just get a wire brush and have a go, firmly dragging in same direction. Thank you again your talents are amazing. I just peeled a sheet of elmers brand foam core board. The paper came off so easily, it was almost one entire piece. The board is curling a bit now, but I haven’t cut it into the size I want to use, so I think that will stop when it’s a smaller piece. Elmers brand can easily be found at Walmart ect. The black one? Thanks for the info. Yes black. And as soon as I peeled both sides it lay flat. Turned out perfect! This is amazing! But what about pvc foam board? would it not work the same way? and you wouldnt need to peel the paper off… ? Hey what, what? .. ‘pvc foam board’? There’s no such thing? Send me a product link so that I can check what you’re talking about. Maybe someone else from the US can respond if they have found Kapa-line products there. I’m surprised that it’s not available at least somewhere there! I’ve never needed to use water or solvent to assist peeling the black foamboard we have here, mainly because .. either the paper can be peeled relatively easily or if not it’s not worth the bother quite honestly! Unfortunately not all brands of black foamboard are the same (that goes for everywhere) and some don’t peel. I’m sure there must be something in the US that can be used in this way. The problem is you can only find out by testing on the board itself and you need to be quite thick-skinned to do that in a shop before you buy! That’s new to me! .. I’ll try it out.